Be greeted, dear friends on Earth! It is with joy that I come to you today, as joining you during this time, in this phase, is very important as you are all in the gateway to a new era. However, we see that most of you are experiencing this as a time of hardship, several of you even think that this is what life on earth is all about – hardship. However, dear friends, I hope you will understand that the current hardship was not only chosen by you – and it was indeed chosen, although many of you see it as an obligation or even as something forced upon you. Yet it was desired by the soul – of course, right now you cannot understand why your very own soul could choose the hardships you may face. But, you need to understand that on a soul level, there are certain things you see differently, you know why you have to go through certain difficult phases, and why you need to experience certain events and emotions. Your soul understands that even sadness needs to be experienced. This is a little similar to a student who understands that there are some less pleasant exercises that need to be done, some hard exams to be taken. To some, although not all of you, this seems to be a more difficult phase in your life, because you are at a stage of development where certain tasks and tests can no longer be postponed – if you want to pass on to the next level, you need to make up for missed tests and tasks now. Nothing can be left for later – unless you want to return to the current level. However, almost all souls incarnated today seek to complete all their formerly missed tasks and tests, therefore the impression many have, that these times are harder than usual. Yet we have told you before, there is help on your side – there is energy coming to you from higher realms, including a constant beam of light from the central sun of the galaxy, which not only serves to synchronize the ascension, but also assists mankind and all life on Earth to ascend, by raising the vibrational level, the frequency is adjusted so that the transition becomes easier. However, you need to do your part as well, as we have told you many times. Although more and more of you are awakening, and there are even more and more of you who begin to do your work, there are still many who know they should be actively participating in their spiritual growth, but are only within their knowledge, but not in the implementation of that knowledge. Knowledge has little use if it is not applied, if it is not practiced. Now, even more than ever, is the time to seek certain basic knowledge and apply it. I am predominantly referring to simple techniques that are called the “triple light protection” by Emmanuel, as this is a very simple but very effective way to raise your vibration while protecting you, and at the same time assisting you in your own transition process in a way that is adapted to your very own personal needs. The more of you that practice this or a similar light work at least once but for more effectiveness twice every day, the more likely a smoother transition becomes for all of mankind and all of life on earth. Currently you are seeing an increased seismic and volcanic activity. At this moment I see this trend continuing, but mankind can change this – the more lightwork that is practiced, the less Mother Earth needs to shake itself, in order to process her own transition. As you send out more light, you assist not only yourself, but all around you, and as such also mankind and Mother Earth. So it becomes obvious, that your part is important – each and every one of you is a vital piece, and plays an important role, even if you do not feel you do. Yet so much depends on the way you think, on the way you feel, and what you do – if you could only once see what we can see, how much difference it makes when just one more human being turns to daily lightwork, you would not hesitate any longer, you would make sure you do this at least twice every day, and would try to convince every human you meet to do the same. However, you cannot see what we can see, and thus mankind may have to learn the hard way, but our goal is to help mankind learn by turning towards the light, and seeing the wonderful, if not incredible, effects the light can have. And be reminded – the cosmic light is universal love, it is the same energy – so when you shine out light, you are practicing sending out more than just light, you are also sending out love. Light and Love are the purest and highest forms of energy, they are divine energy. So, dearest friends, accept the tasks you have chosen – even if they seem too hard, too difficult, too painful. Just get them done, not out of obligation, but out of love towards yourself and towards the creation, and God, the creator, himself. Complete your tasks with love, and if you add daily lightwork, you will notice that you can complete your tasks much more easily. Now is the time of big tests for many – tests of faith, tests of dedication, tests of devotion. Are you up to the task? We know you are – but now is the time you realize that for yourself. You are ready, you have been preparing for centuries, for many lifetimes, for this. Now is the transition, now is the time to apply yourself, to apply what you have learned, and go on in faith and complete your tasks and tests in confidence, with Love, and filled with Light. Be blessed, dearest friends. Amen. 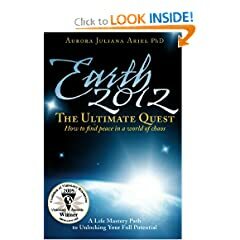 In Earth 2012: The Ultimate Quest, Dr. Ariel guides the reader on a personal quest, providing a powerful key to inner peace in her revolutionary breakthrough Counseling Theory and Practice, TheQuest. Distilled into seven powerful steps, this healing process is designed to accelerate a personal and planetary transformation that could help end suffering on Earth. Her message: If we want to avert the dire potentials before us, we must look within and unlock the subconscious patterns behind our challenging life conditions. Cataloging the profound shift presently taking place within the psyche of humanity, Dr. Ariel points to the fact that we are living in unprecedented times! 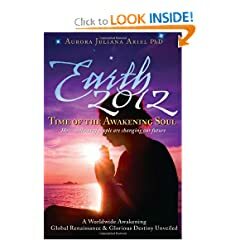 Weaving a blend of sacred prophecies, scientific predictions, and prophetic visions around 2012, she unveils a glorious potential that is casting its first rays of light on earth, illuminating the Dark Night we are presently passing through, and providing a missing piece to traversing the challenges of this time. Be greeted, dearest friends on Earth! As I return to speak to you, I come to you with blessings from the highest realms. While this is a time with lots of challenges for many of you, it is not a time of despair – you are not alone in your efforts, we have said so many times, but we also feel we need to remind you over and over again, because many of you still feel they are without any friends, without anyone on their side. But this is not so – not only is your spirit guide on your side, as well as your guardian angel – but there are many other friends in spirit around you, friends from previous lives who are not incarnated at this time, as well as teachers and guides from higher realms who come to you from time to time, and much more frequently now as you near the transition into the new era, Aquarius. But help is with you not only in form of beings, but also energy – there is an increasingly stronger beam of light coming to you from the central sun of the galaxy, which is on an invisible frequency as you cannot see ultraviolet light, but this beam of light is getting stronger as the process of the transition progresses. Even some physicists have been able to detect this beam of light, although they are uncertain of its reason and origin, yet of what influence it has on Earth and mankind. Indeed it is an energy that not only helps with the transition, but is capable of helping with cleansing earth’s energy field as well as that of all life on the planet. While this is a tremendous help for Mother Earth, it also has some less pleasant side effects as the Earth begins with its cleaning process, resulting in some discomfort for life on Earth. Yet this is necessary to prepare Earth for the higher level of vibration to which Earth is beginning to move to. However, some other side effects are that many humans now have to solve the issues they have put off for years – issues having to do with their health, emotions and thought. Yet at the same time, this is not really a “side” effect, it is indeed an intended effect, because now is the time to be prepared for the transition – it is no longer possible to just keep pushing issues aside, they now must be solved. So indeed this beam of light is helping everyone of you – event though you may see it as discomfort and an accumulation of problems – yet this accumulation only exists because you have been putting things off in the past. No further delays are possible, therefore you are now being pushed to finally get to what you keep postponing. While this serves your own good, so you can make the transition together with Mother Earth to a higher level of existence, you might find it annoying or even overwhelming. But, to help you with this, I have been given this blessing from the highest realm to pass it on to you, from God Himself, a blessing that can help you with dealing with the overwhelming problems you may face, if you choose to accept this blessing. You may wonder, but how can this blessing reach me? I am just reading some words on some website… well my dear friends, first of all it is no coincidence that you read these words, secondly, even though you may be far from the person who writes these words down for me, this does not matter as we can be where we want to be within the time it takes to think where we want to be, so we can be with you when you read this, as by reading this your thoughts change and if you are willing to receive this blessing, we can receive this call as easily as you can receive a phone call. So we will be there when you are ready to receive the blessings from the Lord, regardless of where you are and when you are ready to receive it, even if it is a year or two after these words have been written. May you all be blessed, until next time, dearest friends. Amen. Edited: For some strange reason I had the month wrong… Oct. instead of Jan.!!! Greetings to you, dearest friends on Earth! As you are nearing the transition into a new era, you may become more and more aware of the changes that are taking place. Primarily, we are talking about changes in vibration, as well as changes in the energy field of Mother Earth as well as the cosmic energies coming to earth. However, these changes will have an effect on mankind. Certain older structures such as mental constructs – ways of thinking – and some beliefs will need to be reevaluated. Some ways of how you organize your societies also will need to be reevaluated, eventually most forms of current government may vanish. I am not promoting anarchy, quite to the contrary, I am suggesting that a new form of governing societies is bound to flourish when the time is right, a form that more accurately represents the society and its best interests, replacing current forms of democracy and socialism and even more so, other more antiquated forms of government still in use today such as fake democracies and dictatorships. While this will be a process that cannot happen overnight, nor immediately upon entering the New Age, these are some of the changes that will come naturally, as the current forms of government will no longer be adequate nor suitable for the society of the new era. The advancement of mankind, the expansion of consciousness, will automatically bring these changes, in some places literally overnight yet in others it is a process of years if not decades. Yet you can all assist in these changes, make them smooth and peaceful, simply by doing lightwork for mankind regularly. This will not specifically promote these changes, rather support the natural evolution of mankind, in all aspects, including the one mentioned today. May you be blessed. Amen. Greetings. As you know we are living in a period of transition into a new age. This new time has already begun but your are still on the threshold, still on your way into this new time. The old time has come to an end and a new time has begun. That means, as mentioned before, there will be a lot of changes in the lives of all mankind. These changes will be perceived differently from everyone. For most it will be inner changes, for others these inner changes will also show on the outside and then there are those who appear unchanged but who have changed so much within, that they perceive their surrounding, their reality as totally different. This is now happening and it is also a time of cleansing and purification. These processes are a challenge for everyone. People will be tested – their faith, their ability to discern, their ability to stay centered and to be true to themselves. It is a big challenge trying to find your (true) ‘self’. It doesn’t happen overnight without any effort. Everybody who actively and consciously starts walking his/her spiritual path has the goal to find and live his/her true ‘self’. But what does it mean to find and live the true ‘self’? What is your true ‘self’? Many ask this question and believe their soul to be something completely different. In your essence you are your soul and the reason you often do not follow your soul’s path is that you do not let your soul lead you but let your mind take over. That creates confusion especially if you are trying to find answers in your outside world, from friends and family and you end up getting as much advice as people you have asked. Connected to what I have said above are the upcoming changes that will influence your spiritual energies and mental frequencies. For some it will make life harder as they try different things, alter their path and ask for help from many different sources. That happens on the outside or on mental level but does not reach the core of their being. Your goal is to find your true ‘self’ and live in a state of ‘being’, a state of centeredness, of inner peace, a state of ‘being yourself’. It is difficult to explain this as it has to do with ‘being’. Without having reached that state of ‘being’ it is difficult to find the right words to explain it. But I hope you can get an idea of what I am talking about. The aim is to follow the path and will of your soul, your true essence and to learn your soul is not something separate from you, something strange or higher, something above you, but that you consciously return into your soul, come back with your full awareness into your true ‘self’ and become what you already are. It is as if you were an actor on a stage, and you are so engulfed in your role that you no longer know you are just an actor. You are so involved with the role, that you are convinced you have become that role. Now is the time that you are not only just playing a role on this planet, but that you return with your consciousness to your true ‘self’, your ‘self’ as an actor, as a soul. You will still be able to fulfill your role, but it is time to awaken from this involvement in acting. Another important aspect is, not to look for answers in the outer world, you can only find them within yourself. You already have all the answers within you. This you can recognize when you hear something and feel in your heart, ‘yes, this is right’, as this is the recognition of that, what you already knew. Greetings to you, dearest friends on earth! As we join you on this day which marks for you a new beginning of a time segment [the New Year], we would like to address this specific period of time, as the period between Winter Solstice, Christmas, through Easter and Spring Equinox, is a regenerative period – a time to go within, a time to regain strength, a time where much in nature of the northern hemisphere rests, which is because such is the time, a time to go within, to regenerate. However, as this cycle is within the transitional cycle of earth and mankind, it bears particular significance. In brief, now is the time to really make a true effort to frequently go within, at least once a day meditate for at least 15 minutes, as this will allow the spirit and angel world to assist you to receive blessings from above, to rebuild your strength, and to build your inner capabilities such as the virtues of calmness, faith, and confidence. This in turn will help you deal with the troublesome times ahead, with the confusion that is about to become even more widespread. This confusion is mostly on a mental level, which is why going within, meditating, is so important, so you can maintain or regain your inner balance and avoid getting entangled in these mental confusions. While the confusions will be connected to world events that will have consequences, unintended by those who initiate the events when they are caused by man, others will be connected to reactions to earth’s restlessness and cleansing procedures. However, the reason why these events cause such disturbance on the mind are the changed energy levels of this planet, which influence the way mankind reacts to events. This will flush out that what needs to be dealt with, it cleanses mankind’s thought processes by revealing the weaknesses – which in turn will be seen as the confusion, as many will feel unable to cope with the situations, whilst all the really need to do is stop doing what they are doing, and go within, calm themselves, raise their energy levels e.g. with the exercises we have recommended in the Path of Light. Now is the time to understand and accept the urgency of this issue, as it will be revealed who is willing to accept the new energy levels, whilst those who aren’t will be urged to reconsider their point of view, simply by the events in their lives – as demanded by their very own souls, as they wish to go on, progress with their path. We fully understand that these times are not easy times for being human on this planet, but it is not only that you all requested this mission at this time, but it is also a wonderful, great opportunity for you, to advance with your soul to a new level. Appreciate this grand gift of being human at this time, as many others wanted to join but could not, as they were not as ready as you are. We also understand that many do not feel ready at all, but dear friends, this is an illusion, because if you were not ready, you would not have been allowed to enter this current incarnation. I hope my words were clear enough to be understood by all who read this message. May you be blessed! Amen.